Police nab a first class honours graduate and two final year students of Federal University of Technology Akure, FUTA and three others over Jobs, Scholarships fraud on the internet. These suspects design multinational organisations’ websites to defraud unsuspecting members of the public. 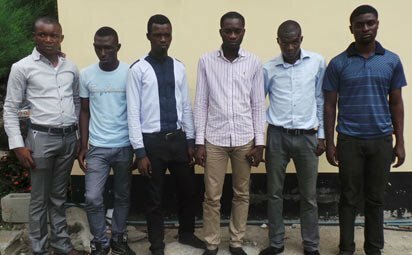 The Police Special Fraud Unit, PSFU, has smashed a syndicate which speclialises in designing multinational organisations’ websites to defraud unsuspecting members of the public, particularly applicants, and arrested six members. Among the suspects are a first class honours graduate and two final year students of the Federal University of Technology Akure, FUTA. The suspects’ modus oparadi, according to the unit, include using logos of multinational companies to place online advertisements for jobs and scholarships and demanding application fee from interested individuals. Luck ran out for the suspects after the unit received a petition from the Organisation of Petroleum Exporting Countries, OPEC, last August, that a website designed as ‘OFID Scholarship Website’ (OPEC Fund for International Development for World Student Aid Scholarship) with OFID name and logo is being used to defraud unsuspecting Nigerian applicants. Explaining how they were arrested, spokesperson for the unit, Ngozi Isintume-Agu, a Deputy Superintendent of Police, said: “The petition dated August 22, 2013, said in the website, applicants were required to pay a fee of N2,500 and over 2,000 applicants responded through FirstBank account number 2020874607 and Access Bank account number 0056941009 with the name, OFID WSAS NG. “The petitioner stated further that it was one of the victims that contacted OFID via facebook, accusing it of being an accomplice in the fraud. “ The Cybercrime Section of the unit swung into action and the mastermind of the fraud, one Falade Oluwapelumi Ayotunde, was arrested. “His arrest led to the arrest of five other syndicate members. Police investigation so far revealed that over 2,000 applicants paid N2,500 each into the two bank accounts provided by the suspects and the principal suspect is the only signatory to both accounts. “Twenty-five- year-old Falade Olowapelumi Ayotunde, a 500-level Estate Management student of the Federal University of Technology, Akure, FUTA, in his confessional statement to operatives of the unit, admitted to have designed the website of OFID WSAS in June, 2012. “He, however, claimed that the idea was sold to him by Fajobi Olalekan and Bolatiri Opemipo. He also admitted in his statement that he opened an account in both banks with the name OFID WSAS NG for applicants to pay in their application fee which many responded to. “The suspect who hails from Akure, Ondo state, further stated that he and his cohorts printed a postal for OFIDWAS which was on the website. On his part, Asaolu Victor, 25, a graduate of Mining Engineering from FUTA, admitted to have assisted to paste the posters on-line. Asked if he was aware that the scholarship programme was fake, he nodded in affirmative. Also on his part, 27-year-old Fajobi Olalekan, a first class Mechanical Engineering graduate of FUTA and the best graduating student in his department for 2012, told operatives that he only lent the alleged mastermind N12,000 to host the website. According to him, “while in school, I lived in the same lodge with Ayotunde. He and his friends were always coming to me for educational assistance because of my intelligence. I once fell a victim of a scam scholarship known as EDIADS. “Ayo approached me then and got some information regarding it which I believe gave him an idea on how to design his OFID Scholarship Website. Adebomi Oluwatosin, who is also a graduate of FUTA, said he only offered the alleged mastermind professional advice and also lent him N100,000 at the initial stage which was paid back with an additional N100,000. Investigation, according to the Commissioner of Police in-charge of the unit, Umar Idris, was on-going, informing that the suspects would be charged to court soon.